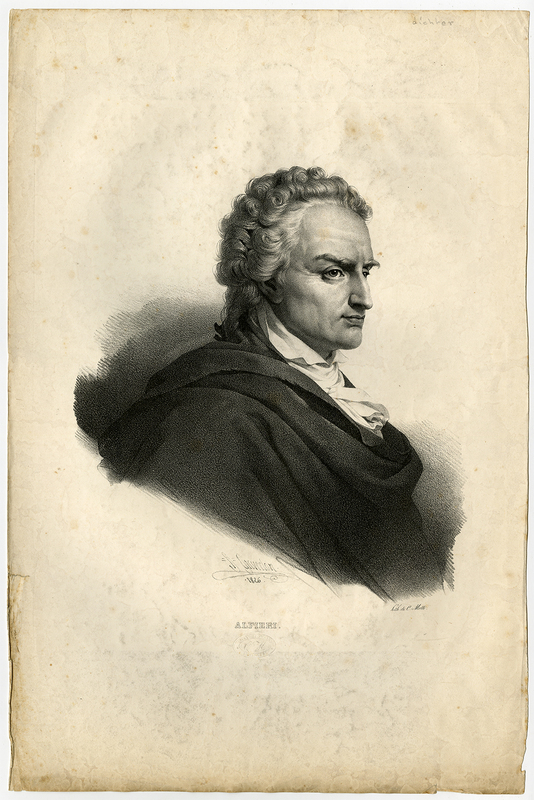 Subject: Antique Master Print, titled: 'Alfieri.' - Portrait of the poet and playwright Alfieri. Condition: Good, given age. Ample margins, some creases and foxing, a small tear in the left margin. Surface soiling General age-related toning and/or occasional minor defects from handling. Please study scan carefully. Medium: Crayon style lithograph on wove paper. Size (in cm): The overall size is ca. 34 x 52 cm. The image size is ca. 34 x 52 cm. Size (in inch): The overall size is ca. 13.4 x 20.5 inch. The image size is ca. 13.4 x 20.5 inch. Artists and Engravers: Made by 'Pierre-Louis Grevedon' after own design. Pierre-Louis / named Henri Grevedon (1776-1860) was a French painter and lithographer. He started as an artist as early as 1789. He studied under Regnault. He later specialised in lithographic portraits.